Dennis and I are not the only ones enjoying the Dogpatch. Stanford is loving it, too. 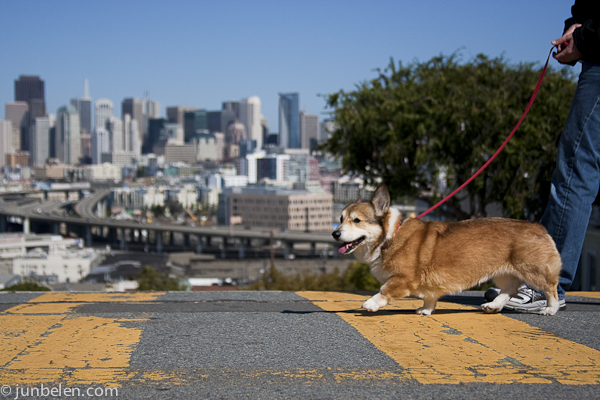 The Dogpatch is actually a great neighborhood for dogs and dog lovers. There’s Esprit Park at Minnesota between 19th and 20th where Stanford loves to run and chase balls. The park isn’t fenced-in but is large enough and surrounded by quiet streets that it’s practically safe for dogs to be off-leash. And best of all it’s only two blocks away from home! 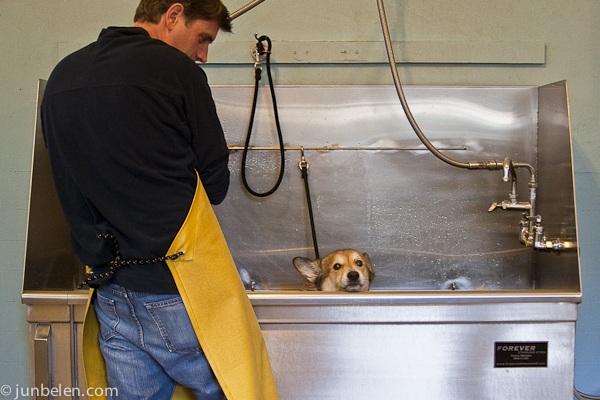 Then there’s Pawtrero Hill Bathhouse and Feed Company with a large and clean self-serve bathing facility. They have the tastiest treats and the coolest toys and accessories. And not far from the Dogpatch, in the Bayview District there’s Pet Camp, Stanford’s home away from home. What we love most about Pet Camp is that they have outdoor playgroups. They have this huge outdoor play space where dogs can run around or just hang out and enjoy the sun. All play sessions are monitored by camp counselors who are the friendliest people around. Check out Camper Cameos, a blog where they post photos of their adorable campers. Well, I’m certain Stanford doesn’t mind all these cool places, but at the end of the day there is something that trumps everything else: dinner! 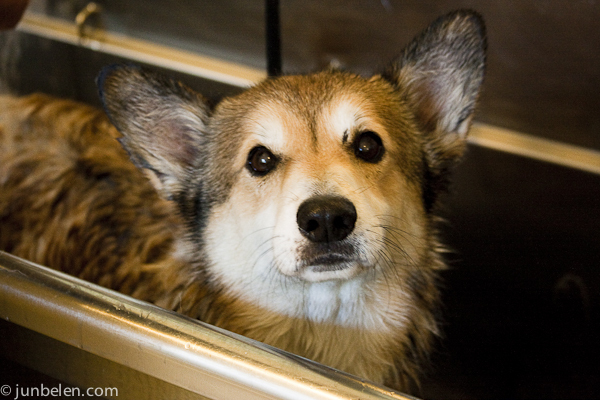 those are some seriously adorable pics of the corgi. i love the one of him in the sink! so cute! Pembrokes are so much fun. I’ve only had Quinn for a bit over a week. Do you have any tips or things you’d wished you’d known when you got Stanford? What does he like to do/play? Thanks! What an absolutely lovely face Stanford has … And the soft fluffy hair around his face is gorgeous. He is such a lucky boy! How is the weather in San Francisco? It’s getting quite cold where I live. Hi Greg, just over a week? You must be so excited!! 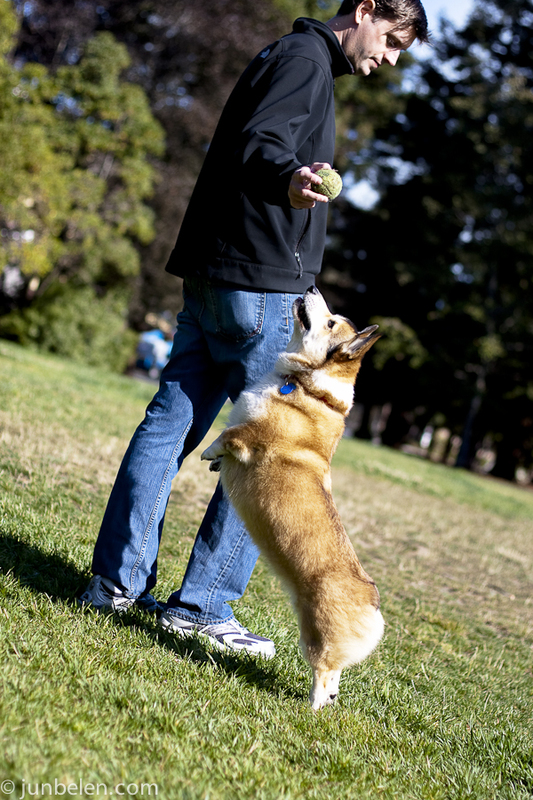 Corgis are very very smart dogs and very active, too! Stanford just loves to run and chase balls. Even with those short legs, he runs so fast! You should take Quinn to a sheep herding instinct test to see if she has the herding instinct. We took Stanford last year to a place up in Santa Rosa and as soon as he entered the pen he went straight to the sheep!! He passed with flying colors. We’ve been wanting to have him trained but it’s a huge commitment so hopefully we’ll find the time to do it. Awwww…. thank you! She is very nice!! Samuel has such a handsome face, too! It has been getting cooler here but still not too cold. Nice and sunny during the day then it gets colder at night. Today for some reason drizzled in the afternoon. Davis, right? I’d imagine it starts to get colder there right around this time. Snuggle up with Samuel!